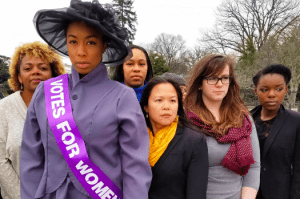 The nation’s oldest public women’s foundation recently announced that it will steer in a new direction over the next five years — toward growing its commitment to low-income women and women of color by more than $25 million. In addition, the Ms. Foundation will form its first-ever political fund, which will support the legislative agenda for women and girls both nationally and locally. 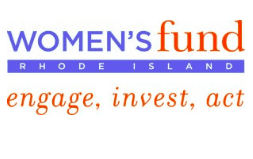 Women’s Fund of Rhode Island made $50,000 in grants recently to local organizations doing gender equality work. Last Wednesday, the Women’s Fund of Rhode Island (WFRI) announced its 2018 grant recipients. This year, the fund was able to provide $50,000 in grants to invest in several local organizations. While WFRI is not as big as some women’s funds in other states, the fund still does important grantmaking to support gender equality advocacy and female leadership development. 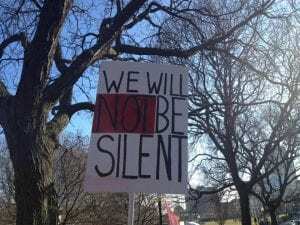 Thirty-four nonprofits applied for grants this year, all being asked to address one or more of WFRI’s priorities in feminist advocacy. 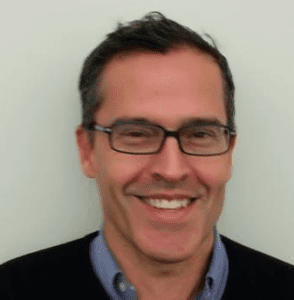 David Gough, CFO and Vice President of Grameen America, spoke with Philanthropy Women about Grameen’s new impact fund, which will make $140 million in loans over the next five years to low income women across the country. 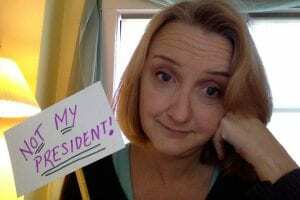 With every day in America bringing news of regressive political changes that will negatively impact women, it’s important for those who want to increase gender equality to explore different strategies for reaching women who need resources. One strategy that recently caught my eye was Grameen America’s announcement that, in celebration of its 10-year anniversary in the U.S., it would enter the fray of impact investing and disburse an added $11 million in capital in microloans to low-income women across the country. With this new fund, over a five-year period, Grameen will make $140 million in loans to low-income women who are struggling to get a foothold in the U.S. economy as entrepreneurs. 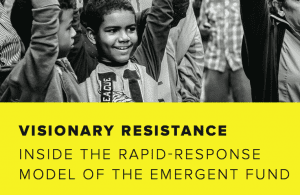 A new report from Oxfam outlines clear steps that governments and the private sector can take to create an economy that works for ordinary people. 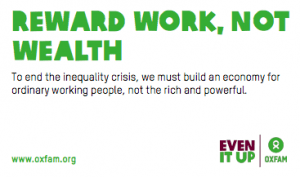 A new report from Oxfam takes a hard look at our growing inequality problems, and outlines steps that governments and businesses can take to work toward a more equitable and healthy economy. Author Mark Rowe discusses the gender equality challenges that we face globally in the November 2017 issue of Geographical. 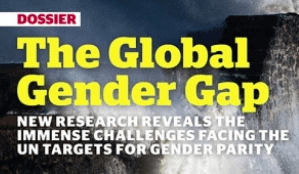 An article in the November 2017 issue of Geographical, a print publication out of the UK, does an exceptional job of summarizing the current research on gender equality globally. Geographical came to my attention after having the opportunity to talk with staff at Oxfam Great Britain (Oxfam GB), in order to learn more about the way Oxfam has approached integrating gender and development for the past two and a half decades. The article points to research showing that making gains in gender equality could add as much as $12 trillion to the economy, but also quotes some experts who are dubious about using economic arguments for achieving political gains for women. Dr. Torrun Wimpelmann says that it’s unproductive to argue with social conservatives using this economic data. Another expert, Dr. Jeni Klugman, author of a high level UN report called Leave No-One Behind, says there is room for the economic argument, since it comes at the issue pragmatically. 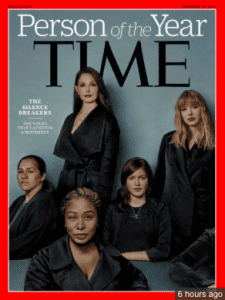 Time Magazine’s Person of the Year are the Silence Breakers: those women (and a few men) who are telling the stories that are changing our culture. 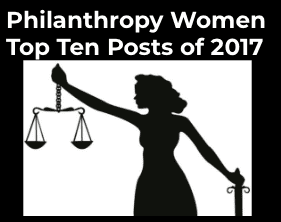 So much exciting change is happening in women’s philanthropy, but one of the biggest breakthroughs by far has been the overwhelming response to the #MeToo campaign, which helps to break the silence on sexual abuse and harassment. While we all have to measure when and were we choose to tell our stories (and as a therapist I have listened to many accounts, and have helped guide people to make choices about how much they wanted to disclose, and to whom) it is heartening to see so many women willing to take the risk and put their story out there.